Astronomikon is the project of two friends: Paris Lambrou (b) and Nicholas Leptos (v), band mates in Cyprian bands Arrayan Path and Prodigal Earth. 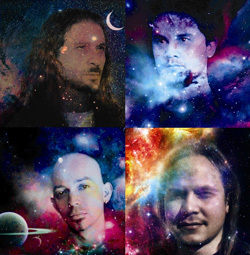 They take their bond of creating classic heavy and power metal and combine it with their interest in astronomy and mythology, god and heroes depicted by the pattern of stars in the sky. Their debut album, Dark Gorgon Rising, tells the story of Perseus, the greek hero who defeated the Gorgon (aka Medusa) and tamed the flying stead Pegasus, among other mighty deeds. Astronomikon tells the tale through music of melodic, often epic, power metal. You can expect the usual things: massive chord structure and a synth layer creating a huge soundscape. Upon these you have Leptos vocals that range from soaring to screaming, but are mostly over the top and, of course, grand guitar solos. Add a touch of ethnic elements as found at the start of A Sad Day at Argos, and you rather epic and bombastic material, worthy of Mediterranean metal. However, it also can sound rather homogenous. Excepting maybe parts of Perseus Eurymedon, Leptos never really lets up. Half way through, his non-stop screamo style was giving me a headache. The pace through out is generally galloping and the tone often crushing because of the often unvarying and generally unrelenting riffage and rhythm section. Alternatively, most songs have favorable parts like the latter third instrumental section of Son of Seriphos. Mostly, though, Dark Gorgon Rising revs up, gets a head of steam, and doesn't really stop. For traditional galloping power metal this is the real deal. 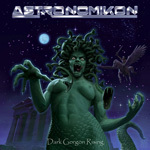 Astronomikon's Dark Gorgon Rising revs up, gets a head of steam, and doesn't really stop. For traditional galloping power metal this is the real deal.